This work is from UND’s second national print portfolio competition for undergraduate students: Night Vision – Printing Darkness - Selected student works from Plain Brown Wrapper 2008 Print Competition. 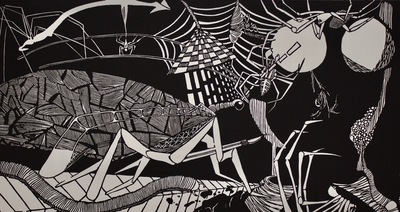 The competition was developed in 2005 by Professor Kim Fink to bring attention to college-level printmaking programs. Not surprisingly, the intaglio techniques of aquatint, drypoint and etching dominate, as they have from the age of Rembrandt and Goya, when artists needed to portray darkness in print. The velvety rich blacks and atmospheric plate tone of an etched plate have produced prints in this portfolio, which depict surreal space and the fears and anxieties of night.